Wouldn't this be perfect for a rustic or country wedding? This vacation rental features a large flagstone courtyard with gorgeous views of the Catalina Mountains. Who wouldn't want this view for wedding photos? This is looking west from the Cowboy Hideaway estate. A picture of the grounds the Yellow Barn and Bunkhouse sits on. The property offers plenty of options and potential for a perfect wedding. A great kitchen for entertaining. The outdoor kitchen and large patio would make a lovely backyard wedding. You rent a house from Airbnb for a weekend and you're set because it can serve not only as the venue for your wedding and reception, but can also double as the bride's quarters, a place for visiting family to stay, or a honeymoon suite. This will take a little more work than booking a resort, but it's an affordable way to create the wedding of your dreams. So, if you're the DIY type, this might be what you're looking for. We scoured Airbnb for houses that would make nice wedding venues (there's a filter for events in the search options) to give you some ideas. Also, make sure to check out our Tucson Wedding Guide for more ideas, helpful tips and a searchable database of more than 200 local wedding vendors. This is a gorgeous two-room cowboy guest house nestled on a five-acre estate. The owners live in the main house, but it is totally separate. There's a beautiful courtyard-type patio in the middle that would make a lovely space for a small wedding. There's also a pool (can be used for event with a waiver and additional fee), putting grounds, basketball court and several other covered and uncovered patios. A mother-in-law suite is offered in the main house in case the bride and groom want their moms nearby to help with the wedding. The estate's owners, Patrick and Kiki King say the property is best suited for weddings with 50 or fewer guests. There's an additional event fee of $1,500-$2,000 to host a wedding. The nightly fee for the casita is $72 and there is a four-night minimum stay. It would make for a lovely staycation honeymoon after the big day. When sending your inquiry, the owners want to know how many guests, when the wedding and reception will begin and end and who you'd like to cater it so they can give you a better idea of cost and options. 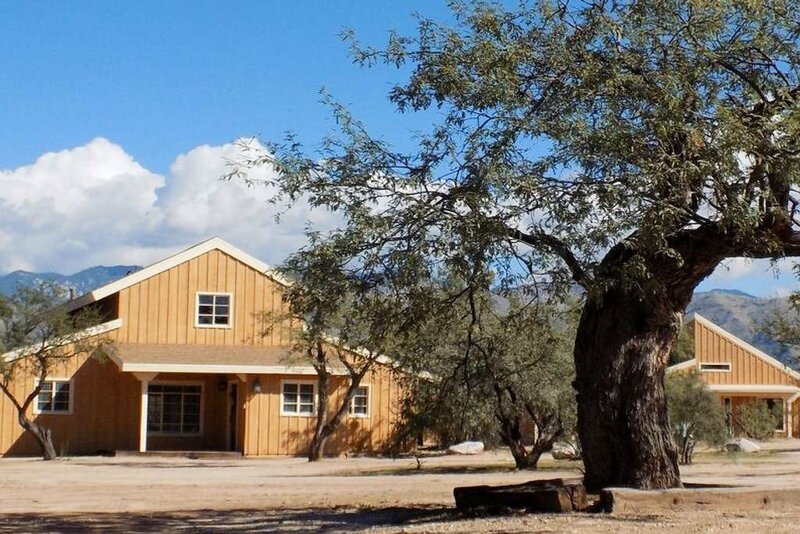 There are six bedrooms and five bathrooms between the barn and bunkhouse which sits on four acres near the Santa Catalinas. It has a large open field with a fire pit and gorgeous views of the mountains, a playground to keep the kids busy, a pool and hot tub. It sleeps 16 and can accommodate about 80 people for an event. When you rent this property, you get full use of the common rooms in the Barn which includes kitchen, dining room, living room, fireplace room, two bathrooms and master bedroom as well as the bunkhouse, aka the guesthouse. "The outdoor space features panoramic views of the Catalinas, and a quaint walk over a footbridge to an open field," said Leslie Howe. "Hosts can line the walkway with lanterns or candles. This venue is perfect for a couple that wants time to set up and decorate and who enjoy a one-of-a-kind venue experience." The cost is $650 per night with a two night minimum and a $150 cleaning fee. You have full control of everything, from catering to entertainment and decor. This gorgeous four-bedroom house sits on one acre on the northwest side of town, is fully furnished and sleeps up to eight guests. It also has a pool and hot tub. Perfect for relaxing before or after the big day. The house would be best for a small wedding of 50 or fewer people, said owner Alisha Packer. The cost is $128 per night plus $500 for hosting a wedding. She's a high school dance teacher turned wedding dress designer. This one's for you, maids and matrons of honor. Get in shape for the big day.